"This is a great alternative to potato chips." Preheat oven to 400 degrees F (200 degrees C). Grease two baking sheets. Arrange sweet potato slices in a single layer onto baking sheets. Stir together butter, salt, brown sugar, and cinnamon in a small bowl; brush onto sweet potato slices. Bake in preheated oven until edges curl upwards, about 20 to 25 minutes. See how to make crispy baked sweet potato chips with a cayenne kick. The trick is to cut them extremely thin like a potato chip. I also decreased my oven to 375 degrees. These were really really good. I just used spray butter instead of melted. This is one of the best and easiest sweet potato recipes. Amazing! 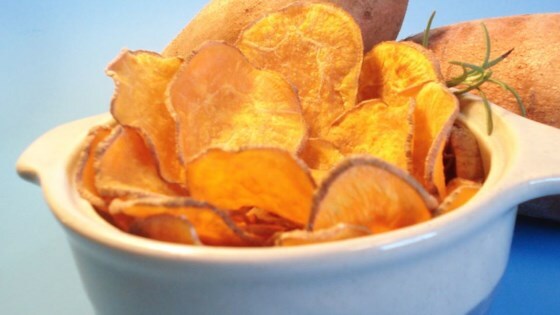 These were easy to make and healthier than regular potato chips. As stated before, the thinner you slice them, the better. I will definently be making these again! I sliced these very thin and baked them at 350 as another reviewer suggested. I set the timer for 20 minutes, and at just 15 they were all burned and had to be tossed!